An excellent 1855 first edition example of Colton's map of Virginia. Like most of Colton's state maps, this map was derived from an earlier wall map of North America produced by Colton and D. Griffing Johnson. 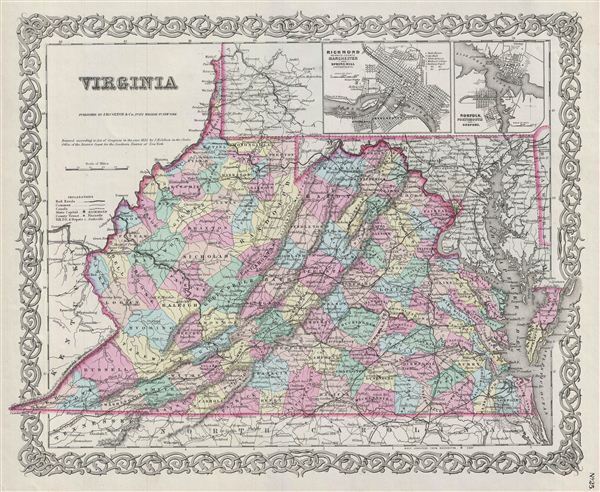 This map covers Virginia roughly seven years before it was divided into West Virginia, and Virginia. The map includes all of the territory between the Ohio River and Cumberland Mountains east to the Chesapeake Bay and Atlantic Ocean and from Pennsylvania in the north to the North Carolina border. The top right quadrant contains two inset maps of Richmond (with Manchester and Spring Hill) and Norfolk (with Portsmouth and Gosport). Names the Cumberland Gap, Chesapeake Bay, Alleghany and Shenandoah Mountains, and the Dismal Swamp. This map was issued at the height of the American westward expansion. Six years before this map was drawn the California gold discovery of 1849 enticed thousands to embark upon the rigorous transcontinental emigration. Meanwhile, with the rise in territorial population to the west of the Mississippi, the eastern states were becoming increasingly divided over the issues of slavery and state vs. federal sovereignty. In Virginia, around half a million people were enslaved. Within five years these disputes would lead to the American Civil War. The war would prove particular hard on Virginia as it hosted both the Union (Washington D.C.) and Confederate (Richmond) capitals and saw more Civil War battles than any other state. This map also identifies various forts, rivers, mountain passes, fords, and an assortment of additional topographical details. Map is hand colored in pink, green, yellow and blue pastels to define state and territorial boundaries. Surrounded by Colton's typical spiral motif border. Dated and copyrighted to J. H. Colton, 1855. Published from Colton's 172 William Street Office in New York City. Issued as page no. 25 in volume 1 of Colton's 1856 Atlas of the World. Rumsey 0149.031 (1856 edition). Phillips (Atlases) 816.